Once I had found my perfect gown it was time to finish another very important dress shopping journey... the search for the bridesmaid dress. I originally thought I would want everyone in different style dresses to compliment each body shape but as I started the hunt I realized that would be harder than I anticipated. With so many different fabrics and shades, keeping all six dresses somewhat uniformed ended up being more work than finding one dress that was flattering for all. Once I ruled out the mix-match dresses, I started to focus on finding one style that would flatter and compliment everyone. I didn't want my bridesmaids to break the bank but I wanted them to look stunning in whichever dress they wore. They are all beautiful girls so I knew that wouldn't be too difficult. I started narrowing down the options but there were hundreds of choices to consider. While choosing the dress that my girls would be comfortable in and glad to wear all day, I stuck to my own style and vision. In the end, this is what helped me narrow down all the options to the winning dress. They all liked the final selection, or so they said, which gave me a sense of relief. I've heard stories of bridesmaid drama over the dress selection and, although I knew that wouldn't happen, I was glad we avoided all and any dress crisis. Some of the dress contenders. The winning dress... JK. That's top secret for now. It's important to keep in mind that it takes two to three months for dress orders to arrive, unless you get lucky and find a boutique that has them ready to take home. Most of them need alterations and that can take a few weeks so it's always good to give yourself and your maids enough time to order and fit the dresses. As for me and my bride tribe, we just play the waiting game until the little beauties come in... I can't wait!!!! What has your dress journey been like, I'd love to hear from you! I love the black with black and white bottom. So cute! These bridesmaids outfits are adorable! Keep sharing such nice articles dear. 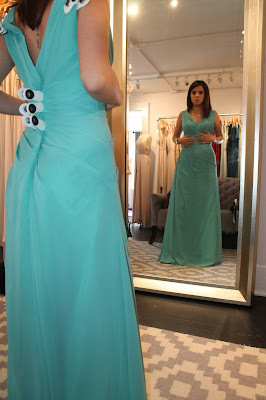 I will be one of bridesmaid in my best friend’s wedding and would like to buy one of such beautiful bridesmaid dresses that are perfect for their outdoor wedding. Actually she is having beachside wedding at most beautiful wedding venues NYC. Thanks benilhalk! I hope you've found the perfect dress.